Screenshot from the music video. They Might Be Giants is an alternative rock band founded by John Flansburg and John Linnell, who first performed together in 1982 and adopted the name They Might Be Giants in 1983. Despite their struggle to find fame, the band became a cult classic following their debut album, the self-titledThey Might Be Giants. Included on this album was "Rabid Child", a relatively short song (compared to others written by the band during the same timeframe) which told the story of a child whose only form of communication was talking with passing truckers via CB radio. A music video for "Rabid Child" was recorded at an unknown date. 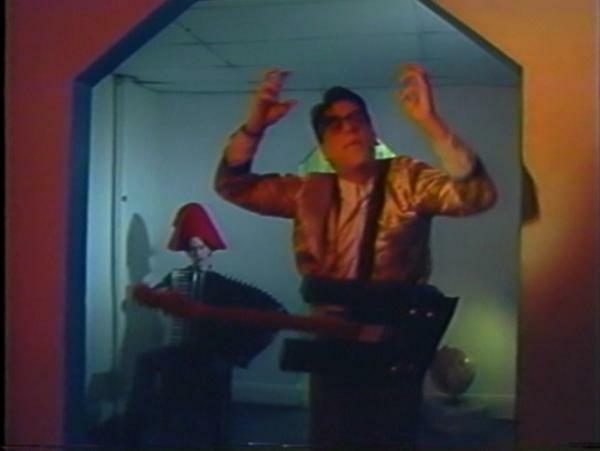 The music video consisted of John Flansburgh, one of the founding members of the band and vocalist on "Rabid Child", singing into a camera and grabbing onto a wall. It also featured some production personnel standing around wearing masks and John Linnell, the other founding member of the band, sitting in the back wearing a red "carpet hat" and playing the accordion. The music video was recorded in Flansburgh's apartment with a cheap video camera. The music video, while not released in full, had a few seconds of footage shown in Gigantic: A Tale of Two Johns, a documentary about the band. The clip was only included as a compromise with producer Aj Schnack after he tried to fight to get the music video included as a bonus feature on this documentary's disc. "I promised fans that I would ask John and John about including the full piece and I was quickly (but politely) laughed out of the room (or would have been if we had been in the same room)." Only available footage from the missing music video.